Cancer is not diagnosed by blood tests alone. 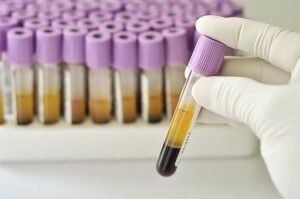 Your blood may be tested for a cancer marker. Markers are chemical substances that can show up in the blood of patients with some types of cancer. There are two markers that some pancreatic cancers may produce, called CEA and CA 19-9. Serum CA 19-9 is more commonly used and is considered to be elevated when its value is greater than 37 U/ml (Units per millilitre). The CA 19-9 is a simple blood test that measures the level of antigens (substances that cause the immune system to make a specific immune response) in the blood serum of a person with pancreatic cancer. CA 19-9 antigens are the substances released by pancreatic tumour cells. The normal range of CA 19-9 in the blood of a healthy individual is 0-37 U/ml (Units per millilitre). CA 19-9 associated antigen levels are elevated in the blood of many patients with pancreatic cancer. There are also some non-cancerous conditions that cause a high level of CA 19-9 which is why it is not particularly useful as a diagnostic test for pancreatic cancer.